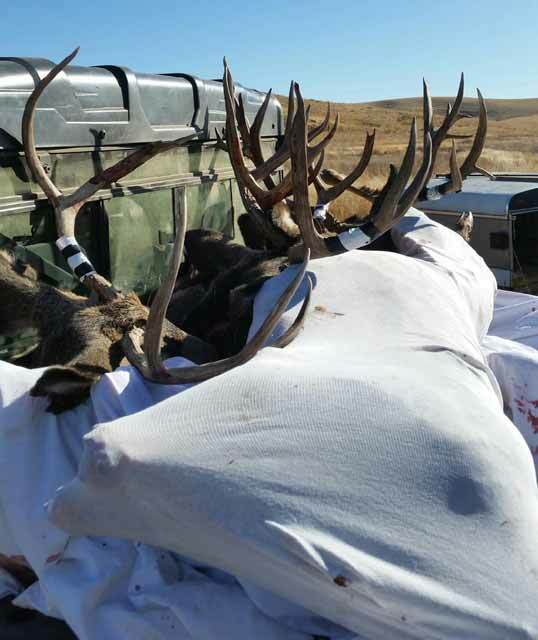 We are offering a limited number of Trophy Mule Deer Guided Hunts and Mule Deer Management Hunts in Washington. Most of our hunts are for Mule Deer, but we do pursue the other mentioned species on request. Hunts will feature well-outfitted base camps, ranch home or lodge-style accommodations. New areas will become available from time to time based on the quality of game available. A number of hunts can be packaged with both pheasant and waterfowl shooting without additional travel, particularly now that Oregon and Washington have adjusted seasonal openings on upland to overlap with Big Game, mainly deer. We feature the best service, meals, and accommodations available. All hunts are 2 hunters per guide, 5 nights and 4 days unless specified otherwise. We will be targeting quality animals that most hunters consider trophies. They will be in the 3 and 4 point bucks, 20 - 25 inch rack size. We will be harvesting these bucks as they become available in the field. Larger, trophy animals are available as part of the trophy hunt package. 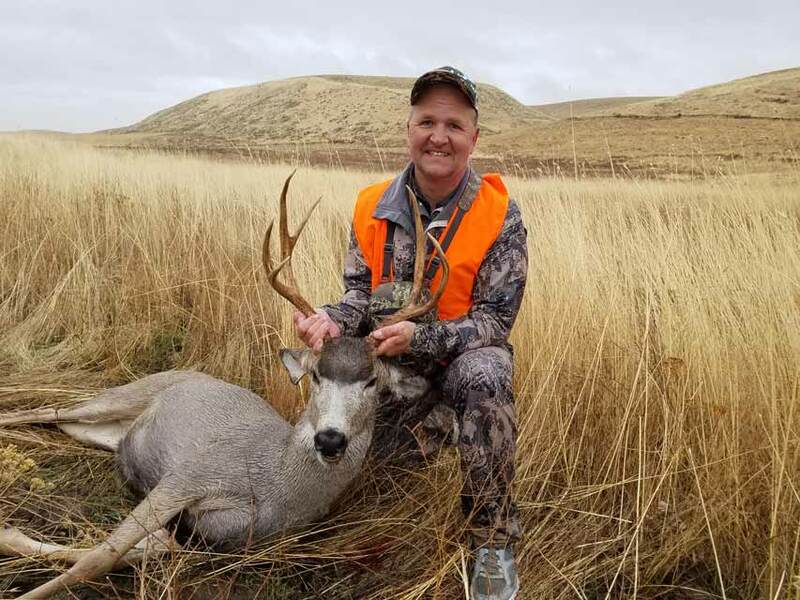 The hunts that take place in Washington state are Washington Units: Ritzville (282), Prescott (149), Almota (142), Harrington(136), Breezy(272) and Sherman (101). The hunting will be primarily spot and stalk, and stand hunting. We will transport your game to a processor and arrange transportation to your home if needed. Approximately 100,000 acres of multiple ranches put together for recreational management purposes. GMUs The hunts that take place in Washington state are Washington Units, Ritzville (282), Prescott (149) , Almota (142), Harrington(136), Breezy(272) and Sherman (101). The ground we hunt includes thousands of acres of irrigated land, incredible grassland, CRP, open range, great expanses of ranch land to hunt. 95% success in 2017, ranch home based camps and utilization of locally based quality motels. Over the counter tags, great hunting, many deer in this vast area of varied terrain and ground cover. There are some great beginner’s hunts, plus plenty of challenging ones. Most of the hunting is spot and stalk is utilized on these ranches. All Washington deer hunts are guided 2 on 1 guide, 5 nights and 4 days, include lodging, meals, on ground transportation, guide, and game in the field processing...Tags will be over the counter general tags . A reservation deposit of 60% of the hunt price is required plus license and tags for all hunts. License and tag is additional for all hunts. Washington Non-Resident Hunting License and Deer tag totals $434, with these tags over the counter. Please note that because of publishing lead time, some dates are tentative. Contact us to verify and reserve your dates. The airport for non-resident hunters would be Portland International Airport (PDX) or Spokane, WA International (GEG), Redmond Municipal Airport (RDM) or another airport of your choosing. Transportation to camp can be provided for an additional fee. 60% deposit is required to book a hunt + Tags and License fees.